Lions and Tigers & Bears, Oh My.... but wait, there is more... Leopards and Jaguars and Servals and Pumas, and reptiles and.... Oh heck, just come and visit ..Just Zoo It! You can even hand feed a Lion or Tiger. You can Shop. You can Eat. Most important is you will have a GREAT TIME!!! 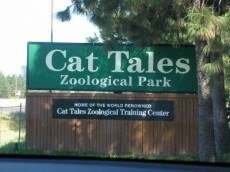 The Best Zoo in the World to learn the profession of Zookeeping at the Zoological Training Center. Individual Membership - $20.00 One Year Admission (Unlimited Visits) 10% Discount in Gift Shop (MUST show Membership Card). Discount may NOT be used for Gift Certificate Purchases. Family Membership - $60.00 One Year Admission (Unlimited Visits) for 2 (Two) Adults and 2 (Two) Children 10% Discount in Gift Shop (MUST show Membership Card). Discount may NOT be used for Gift Certificate Purchases. Support Membership - $80.00 One Year Admission (Unlimited Visits) for 2 (Two) Adults and 4 (Four) Children 10% Discount in Gift Shop (MUST show Membership Card). Discount may NOT be used for Gift Certificate Purchases. Click here for more membership details!